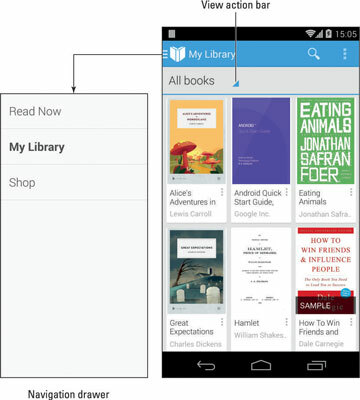 Your Android phone comes with Google’s own e-book reader app. It has the clever name Play Books, and it can be found in the apps drawer or perhaps on the phone’s Home screen. Begin your reading experience by opening the Play Books app. If you’re prompted to turn on synchronization, touch the Turn On Sync button. The Play Books app organizes books into a library and displays them for reading, similar to the way they’re shown in the following figure. The library lists any titles you’ve obtained for your Google Books account. Or when you’re returning to the Play Books app after a break, you see the current page of the e-book you were last reading. You can choose either mode from the navigation drawer. Scroll through the library by swiping the screen. Touch a book in the Play Books app library to open it. If you’ve opened the book previously, you’re returned to the page you last read. Otherwise, the first page you see is the book’s first page. To begin reading, touch a book to open it. 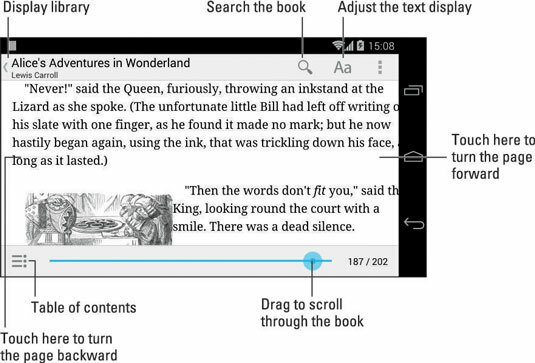 The next figure illustrates the basic book-reading operation in the Play Books app. You turn pages by swiping left or right, but probably mostly left. You can also turn pages by touching the far left or right side of the screen. The Play Books app also works in a vertical orientation, which you may find easier for reading although you won’t see all the icons shown. If you don’t see a book in the library, touch the Menu icon and choose the Refresh command. To ensure that your reading material is always available, touch the Action Overflow icon on a book’s cover and choose the Keep on Device command. That way, the phone doesn’t need an Internet connection to synchronize and download books to the library. To remove a book from the library, touch the Action Overflow icon on the book’s cover and choose the Delete from Library command. The Aa icon is used to adjust the display. Touching this icon displays a menu of options for adjusting the text on the screen and the brightness. To return to the library, touch the Play Books app icon in the upper-left corner of the screen or touch the Back icon. Synchronization allows you to keep copies of your Google Books on all your Android devices as well as on the books.google.com website. If you have a Kindle device, you can obtain the Amazon Kindle app for your phone. Use the app to access books you’ve purchased for the Kindle, or just as a supplement to Google Books.